Excellent website, efficient service and quality product. I contacted Finerfilter to ask for advice on replacing the water filter on my fridge/freezer. I wanted to know if their filters were the same as the currently installed Bosch filter. The lady I spoke with was extremely polite and helpful and guided me through the various option. As a result, I order two and have fitted one which appears to be working very well. This is a win win situation because the filter does the job and costs a fraction of the price Bosch charge. I have recommended this company to friends and will be ordering from them again. 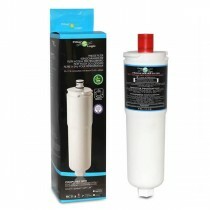 Very easy to change filter.great value.noticed immediate change in flow and taste of water.